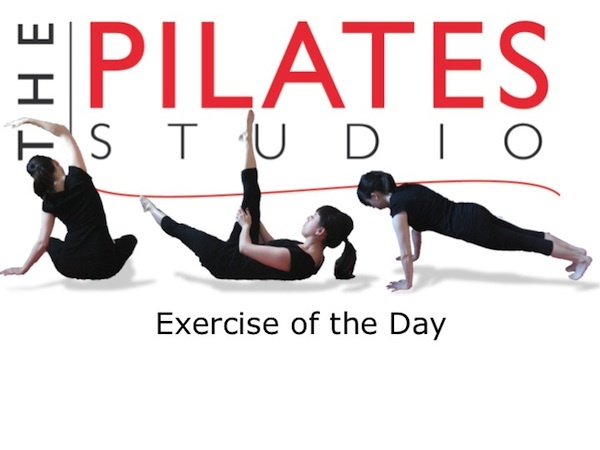 This exercise continues preparing the body for the classic pilates exercise The Hundred. To do this exercise you will need a mat. Start by lying on your back with your knees bent and your feet planted on the floor. Bring one leg up to tabletop position and then add the other leg. Inhale as you float both arms toward the ceiling and then exhale as you press the arms down toward the ground, narrow your ribcage, and press your ribcage into the ground to lift your head, neck, and shoulders. Inhale into the back of your ribcage and then exhale as you lift your head, neck and shoulders higher. Inhale one more time and then exhale as you lower your body back to the ground. If you have osteoporosis, practice the breath pattern with this exercise to find the deep abdominal connection, but keep your head, neck, and shoulders on the ground. The tabletop position will add to the abdominal work of this exercise. It is important to remember to maintain a true tabletop position to get maximal benefit. If your knees get closer and closer to your chest your abdominal work will go away.